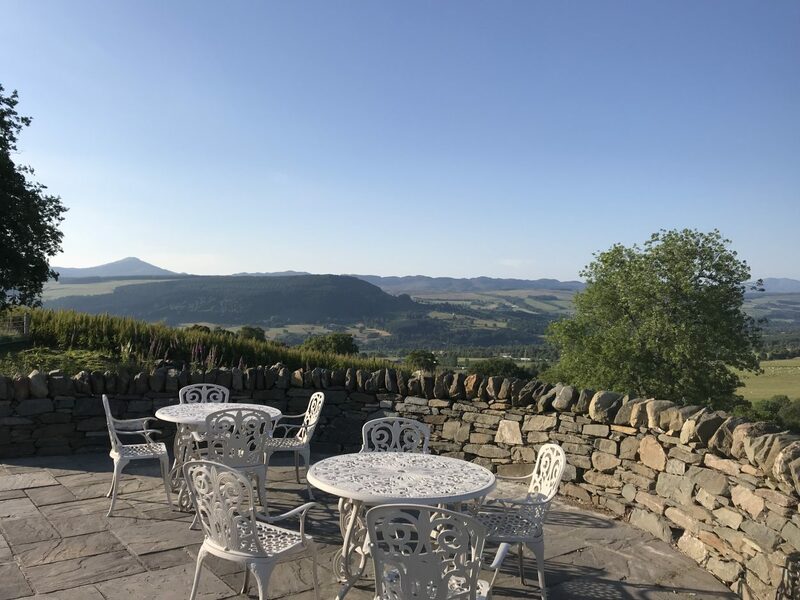 REVIEW Errichel: Where to find Heaven in Perthshire? Perthshire has everything that you could wish for in an escape from the stresses of modern living. 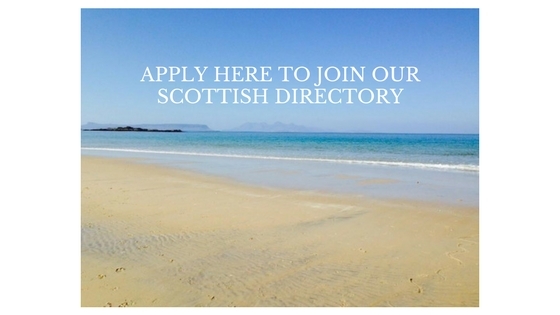 Stunning lochs and hills, peaceful forests and an amazing array of wonderful Scottish farm produce to enjoy. 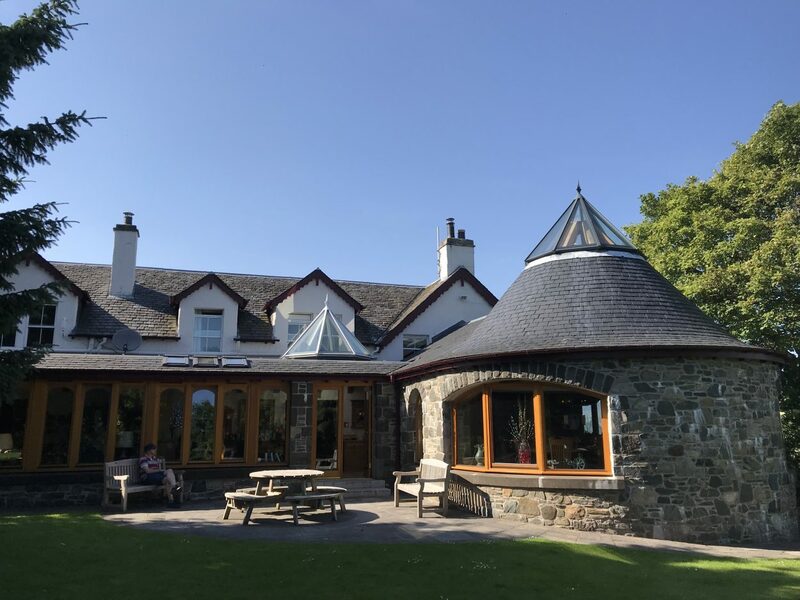 Aberfeldy is the perfect base to enjoy all of this and Errichel House & Cottages offer the ideal place to relax and unwind after a days exploring. 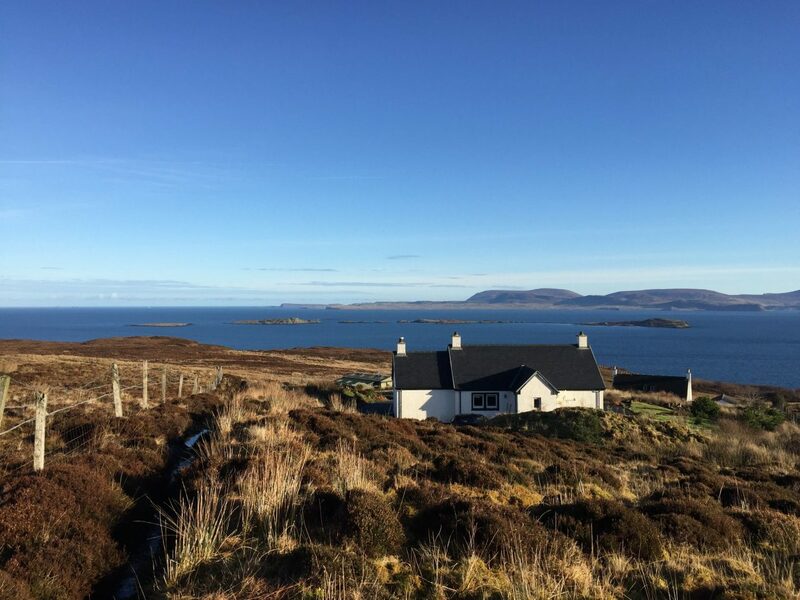 Based on Errichel Farm, it’s a stunning location that provides an unforgettable experience of simple luxury in either their self-catering cottages or their ensuite guest rooms. 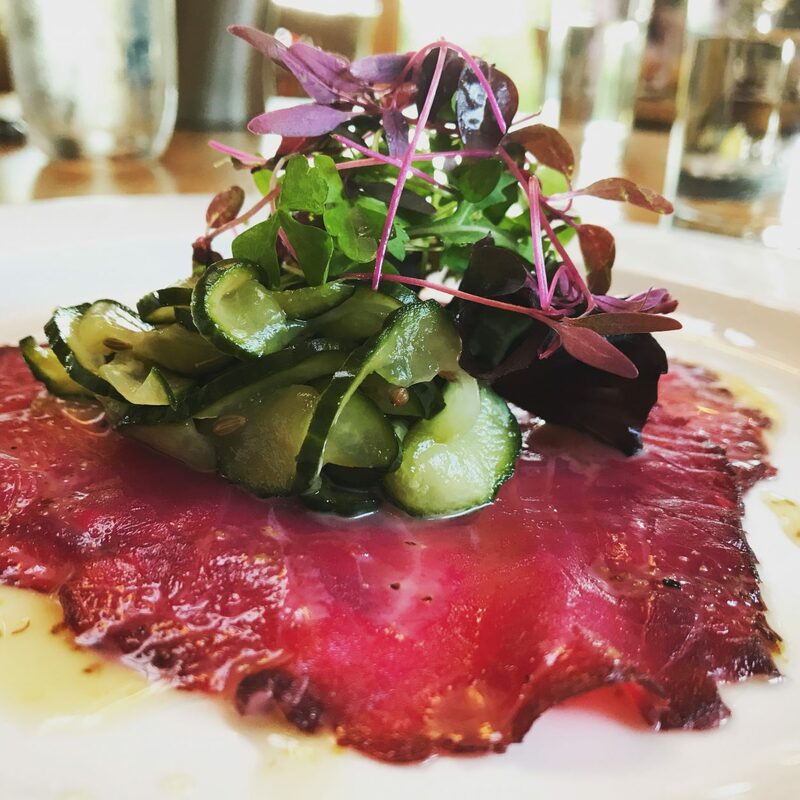 You can also taste award-winning chef-patron Paul Newman’s culinary expertise at his Thyme at Errichel restaurant where you can find out the true meaning of field to fork dining. We started off from Edinburgh on a rather misty Friday morning that turned into sunny blue skies as we took a short drive up the A9 for a spot of lunch by the river Tummel and a wander around Pitlochry. On the way to Aberfeldy, we tasted the Highland Chocolatier’s wares at Grandtully followed by a visit to Castle Menzies then the oldest tree in Europe at Fortingall church. By this time it was gin o’clock and we headed up the hill from Aberfeldy to Errichel Farm. 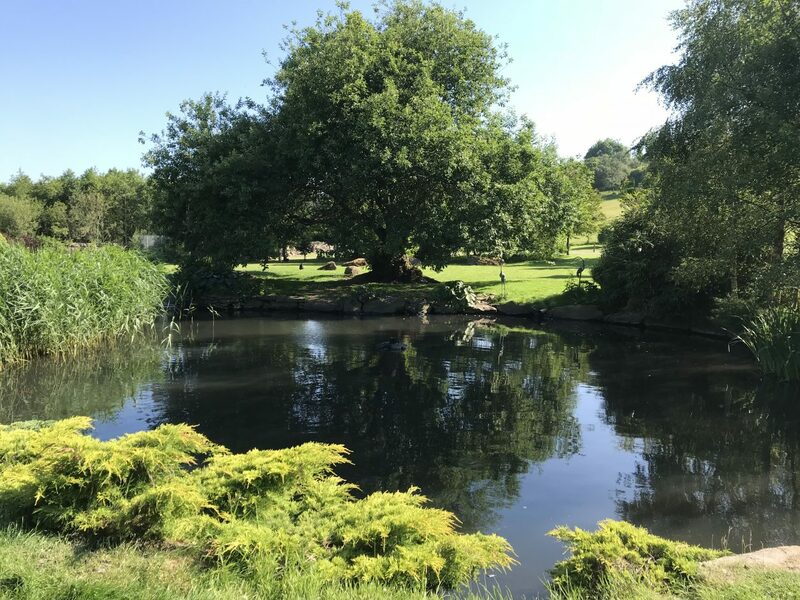 Arriving here is like a bucolic dream, with lush gardens and fields of happy looking Shetland cattle, sheep, Black pigs, ponies, hens and don’t forget the ducks. We received a warm welcome and were soon sitting outside listening to the birds and enjoying a Persie gin and tonic; it felt like we’d died and gone to heaven. Dinner was booked for 7 pm so we made our way up to our bedroom to get freshened up after our day exploring. 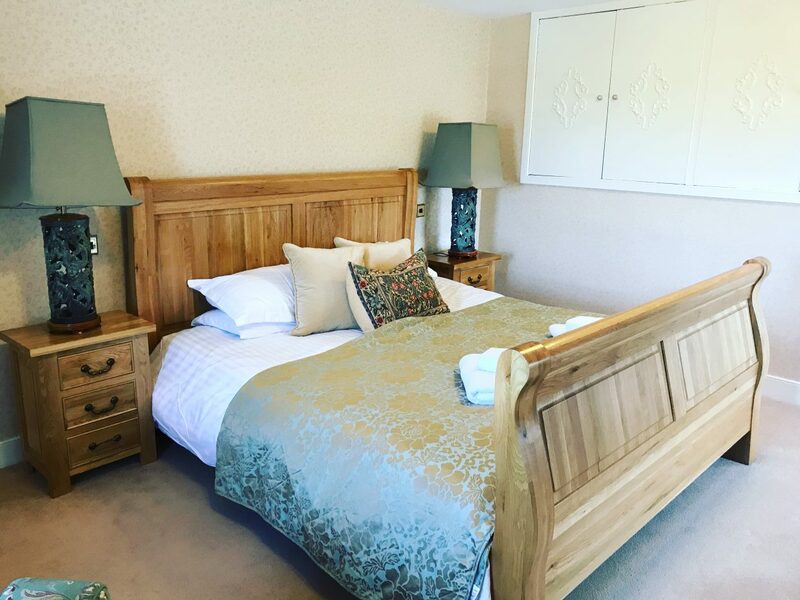 Our bedroom was well appointed with solid oak furniture and an extremely comfortable bed. The bathroom is large with luxurious towels and a bath with an overhead shower plus a nice selection of toiletries. 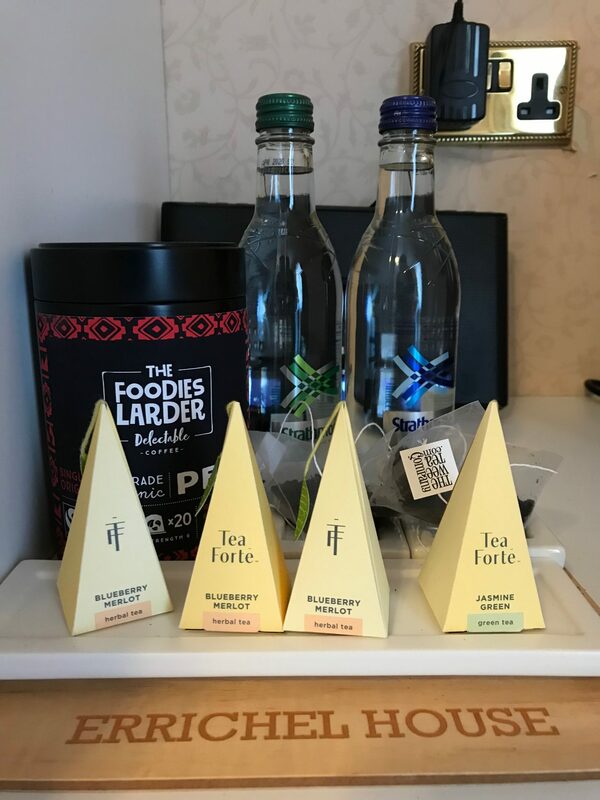 The hospitality tray is packed full of goodies for you to enjoy including The Wee Tea Company Scottish Teas, Tea Forte Herbal Teas and Fairtrade organic coffee pods from Foodies Larder. Room 1’s bedroom window has views over the raised beds of the kitchen garden and in the distance, you can glimpse the famous Perthshire Munro, Schiehallion. 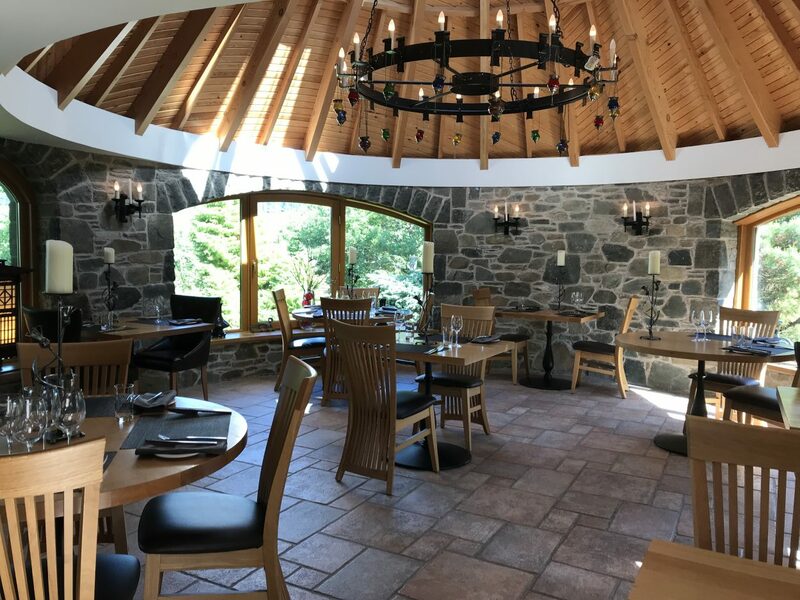 We made our way downstairs to the fabulous stone roundhouse restaurant with its vaulted conical wooden ceiling. Huge windows flood the room with light and it feels like you are still sitting outside in the garden. The room is elegantly furnished with hand-crafted thistle candles scattered around the room adding a welcoming glow. For the winter months, there is a large wood burner that thankfully remained unlit. This is where dinner at Errichel is served. 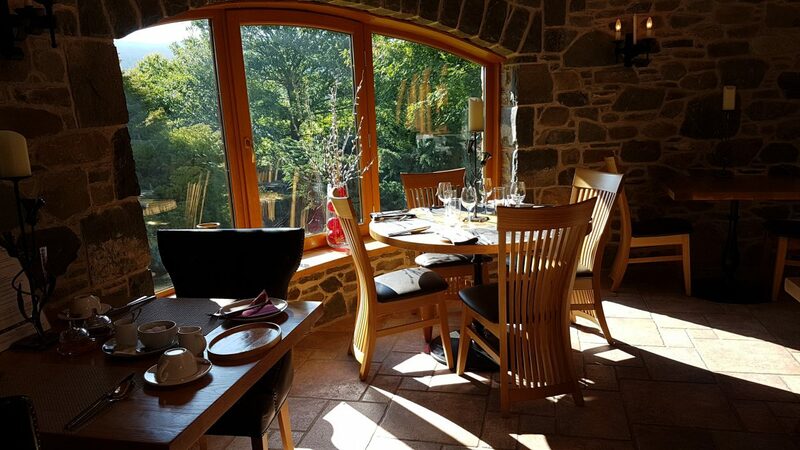 We sat outside on the terrace enjoying a pre-dinner drink, soaking up the sunshine and the views while we decided on our menu choices. I don’t think we have dined anywhere in Scotland where local produce plays such a big part in every dish on the menu. A whole page on the menu is dedicated to the provenance of all the ingredients that Paul uses in his kitchen – many of which come from Errichel farm itself. 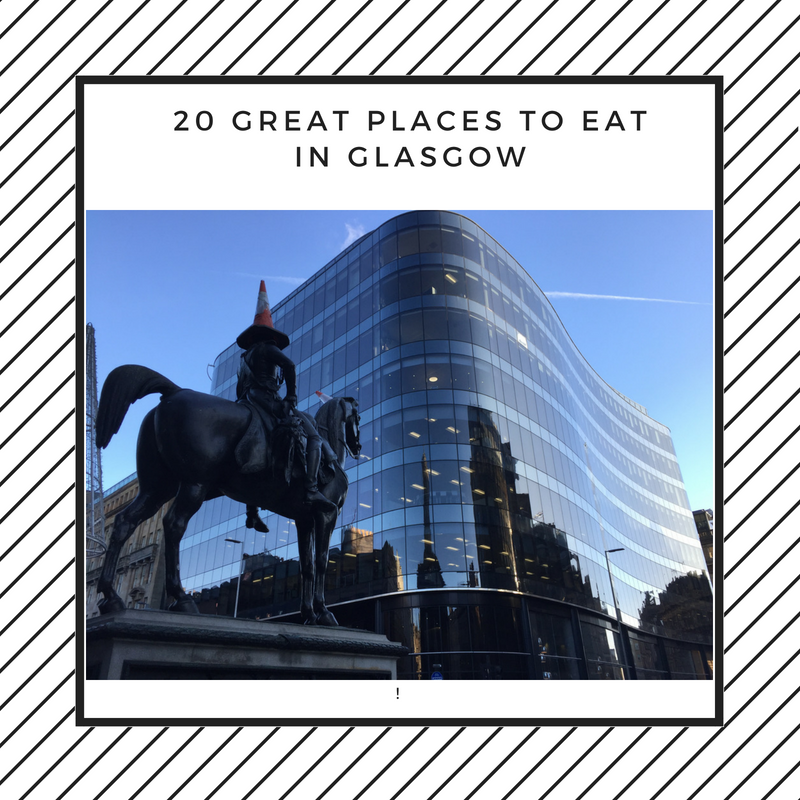 Paul also has a collection of awards including Two Rosettes from the AA, Chef of the Year at the Menu Food and Drinks Awards and The Scottish Food Awards Hospitality honour for services to food and drink in Perthshire. With Paul being a member of the Slow Food Chefs’ Alliance and Errichel Farm and Thyme to Eat members of The Slow Food Association there’s a lot of love in the menu. To start with I chose Paul’s vibrant beetroot cured Wester Ross Salmon. You could happily eat the salmon naked (the salmon that is!) but Paul added an extra special essence of citrus, horseradish and Dewar’s Whisky (from just down the road). The rich ruby colour and the sweet flavour from the essence and honey and mustard dressing made this is a light and delicious dish. Pickled cucumber and micro herbs topped the heavenly salmon and provided a fresh coriander blast. Raymond’s Mezze starter offered a plateful of delicious tastes and textures and looked stunning on its glass platter. 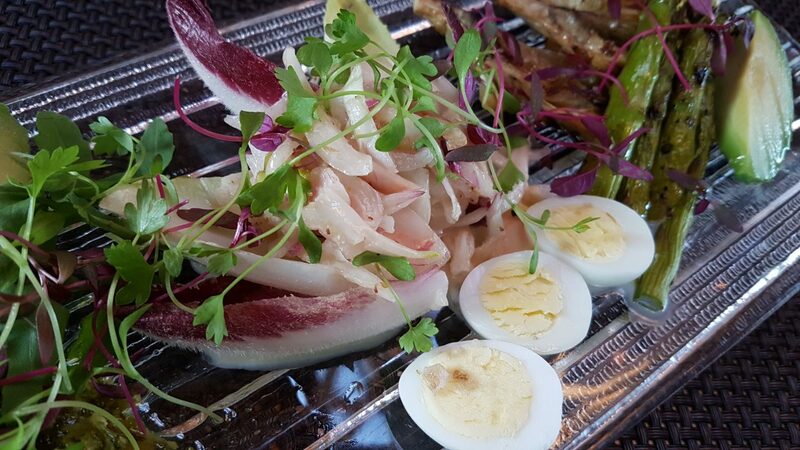 Chargrilled asparagus, quails egg, chicory endive, roasted artichoke and a very smooth guacamole resulted in a light and refreshing starter. Chilli provided heat and the chermoula dressing transported him from a Perthshire hill farm to the streets of Morocco. Interesting, as there are quite a few nods to North Africa at Errichel. 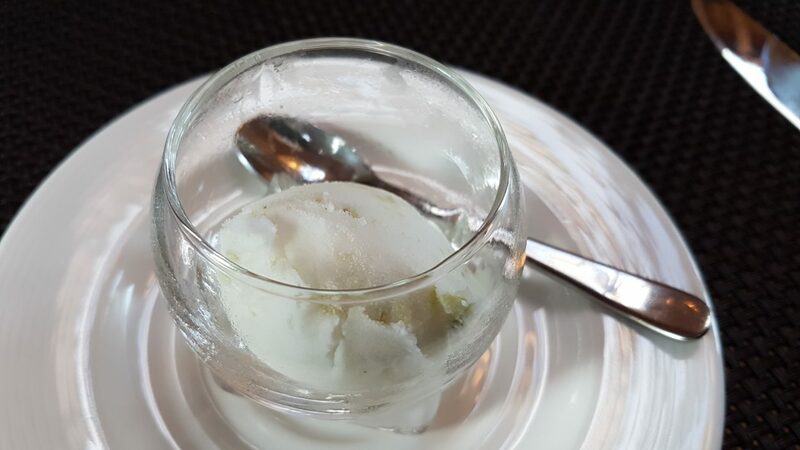 The last twice we have dined at Thyme at Errichel we have enjoyed a thyme flavoured sorbet between our starter and main course. This visit’s variation was particularly delicious! Percie herby gin sorbet with gooseberry, lime and thyme. The perfect palate refresher before the main event! Raymond never eats chicken in a restaurant. That’s pretty much a given. So I nearly fell off my seat when he announced that he would have the chicken! 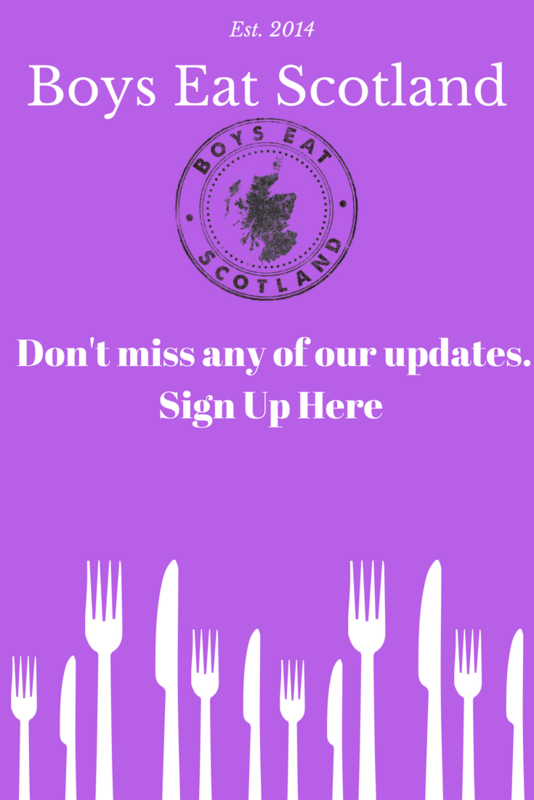 Paul’s farm to fork ethos gives you confidence that you are going to eat food that has been ethically farmed, had a happy life and hasn’t been pumped with chemicals. When the chicken arrived it looked wonderful and tasted like proper chicken should. Deliciously caramelised on the outside the meat is succulent and stuffed with toffee dates, haloumi cheese, butternut squash and sweet potato providing a moist and tasty centre. The dish has a very pleasant warmth to it which balanced the sweetness of the rich tomato sauce. Overall it’s a big hit all around, but I can’t see him ordering chicken in a restaurant again…….unless of course, we return to Errichel! I don’t know about you, but I love Mackerel, so when it’s in season and on the menu I can’t see past it. I made the right choice, as my goodness, what a plateful of delicious flavours arrived. 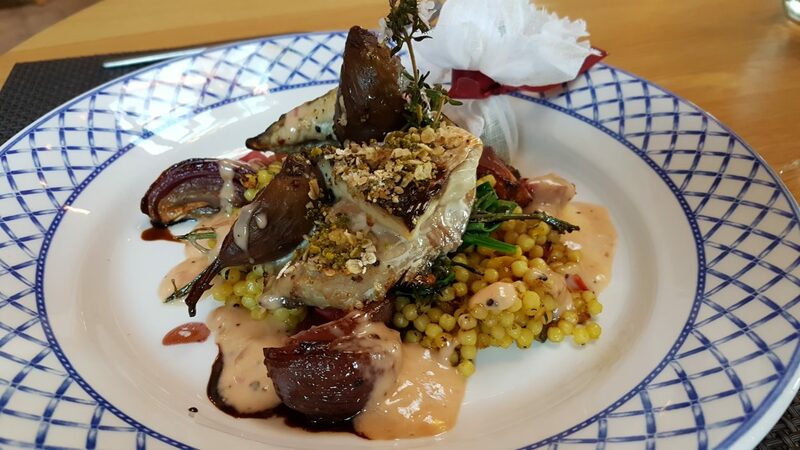 Meaty mackerel fillets scattered with toasted Golspie mill oats, crushed almonds and pistachio and rose petals sat atop a bed of samphire, wilted spinach and giant pearl couscous. Chargrilled red onions and succulent cinnamon infused figs are scattered around the plate adding dashes of colour and tasty textures to the dish. A rhubarb beurre blanc combines all the flavours together and takes the usually bland couscous to a whole new level. This dish was stunning and I loved every bite! Scottish mackerel fillet with roasted figs and rhubarb beurre blanc, pearl couscous, wilted baby spinach and marsh samphire. It’s fair to say portions at Errichel are hearty so we were loosening our belts to fit in pudding! We decided to order the Creme brulee and also the Rhubarb Tart tatain and share. Cracking through the crisp caramelised sugar top revealed an enticing peach and Highland Park whisky flavoured filling. Fresh Perthshire strawberries topped the dish and a side of chocolate chip shortbread paired perfectly with the creamy filling. 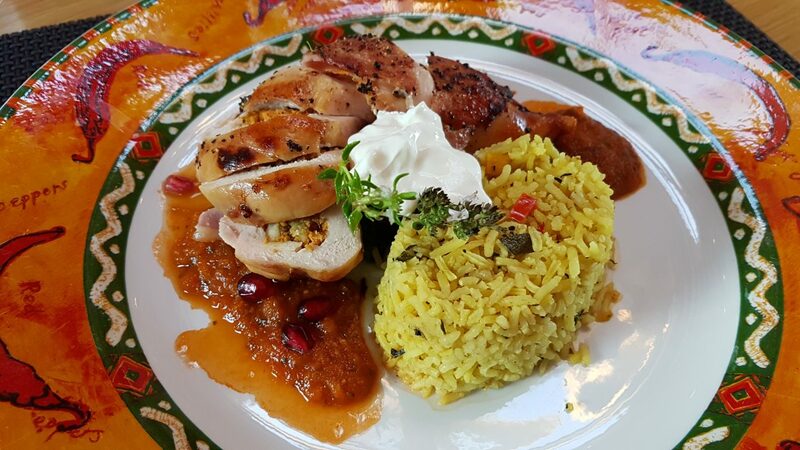 The flavours were rich and the portion large and there was one spoonful left that we just couldn’t manage! We had the second dessert to try and were on our last belt hole! 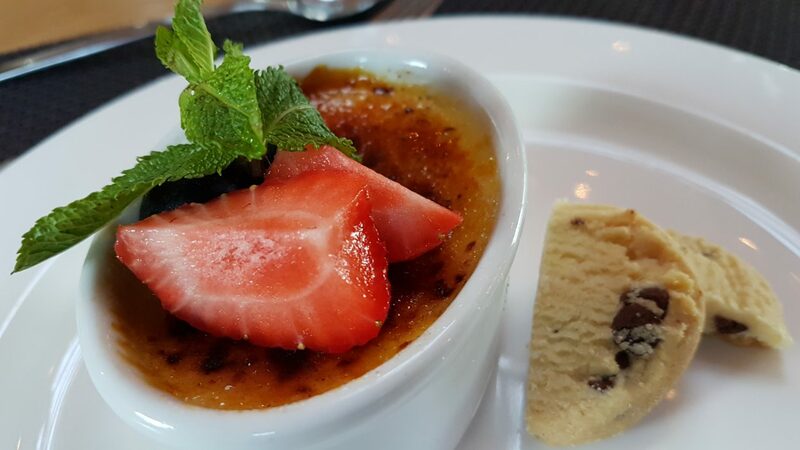 Highland Park and white peach crème brûlée topped with crisp caramel served with chocolate chip shortbread. We were intrigued by the rhubarb tarte tatin with stollen ice cream and cardamom syrup. It felt like the seasons were colliding. Surely we shouldn’t be thinking about Christmas on one of the hottest days of the year. 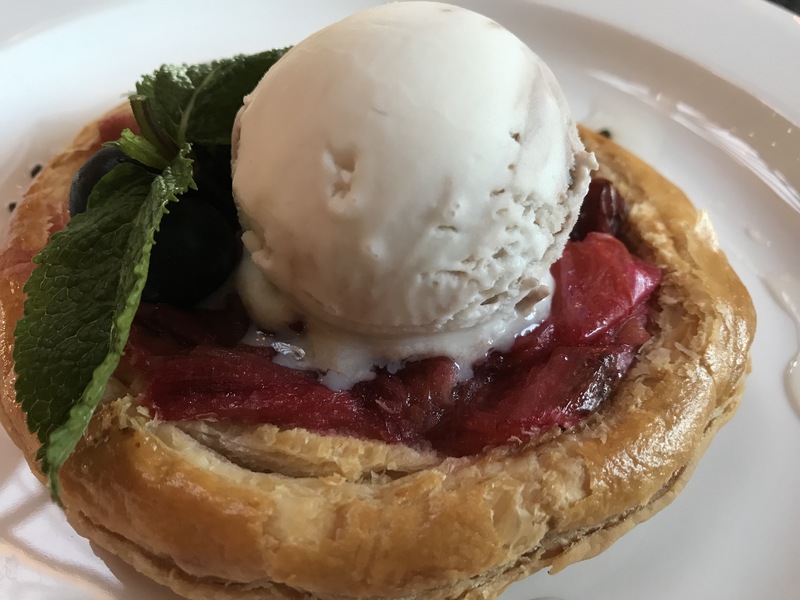 When dessert arrived, the light and flaky pastry case was filled with glistening syrupy rhubarb and topped with a big scoop of ice cream. It looked fantastic and spoons at the ready we dived straight in. The recurring flavours of cinnamon and cardamom were here again but this time challenged by the tartness of the rhubarb and creaminess of the ice cream. Delicious! This was our favourite of the two desserts. After dinner and before we head to bed, we wandered around the farm. The views over the valley are stunning and after the heat of the day, the mists were arriving. We stood for ages watching the sunset behind the hills. What a perfect day in Perthshire. We went to bed relaxed, happy and although full as a whelk, we were anticipating a fantastic farmhouse breakfast in the morning. We slept extremely well and woke refreshed and ready for another feast. 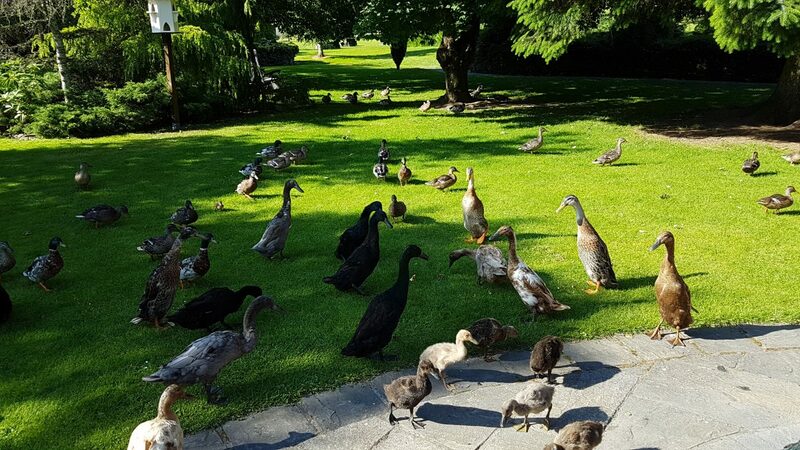 Gathering on the terrace with the ducks, Raymond had great expectations for a full Scottish Breakfast where farm to plate ethos would shine through radiantly once again. He was right! A continental breakfast is available but don’t miss out on an Errichel Full Scottish. 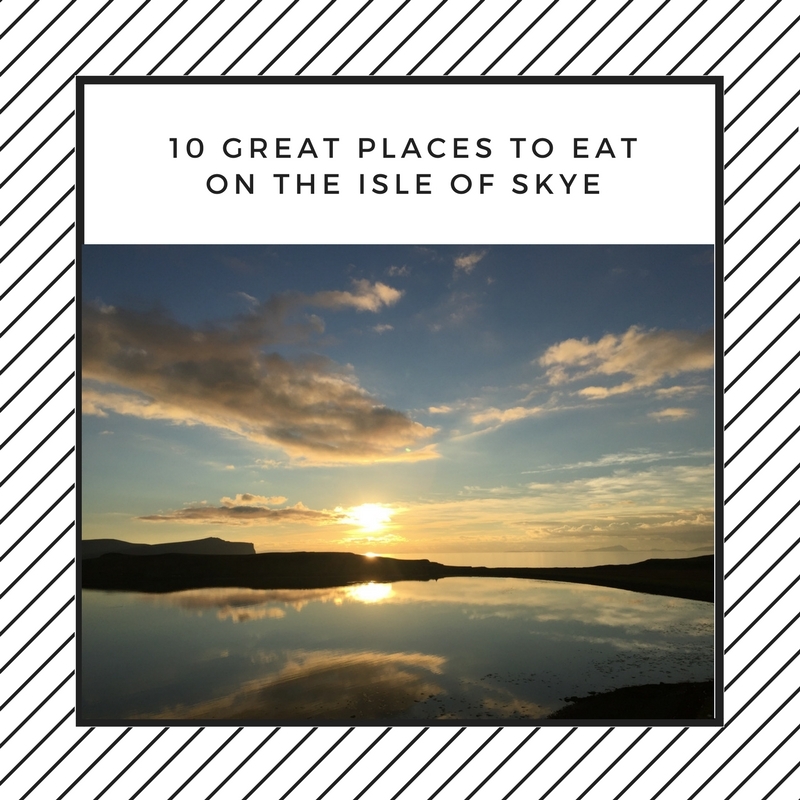 It’s very special and you are unlikely to get better quality or lower food miles anywhere else. 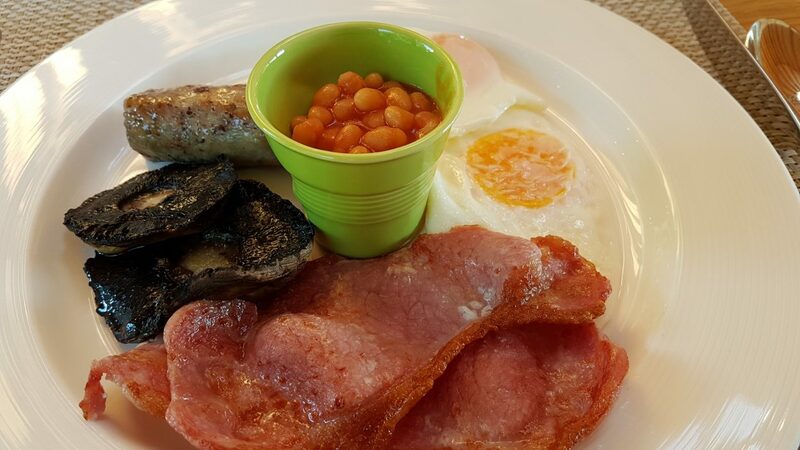 We enjoyed two fried Errichel eggs with Errichel rare breed pork and leek sausages, Errichel rare breed crisp back bacon, large flat mushrooms, Heinz baked beans and the option to add Vegi Sausages, Stornoway Black Pudding and McSween’s haggis! Tea, coffee, juice and toast are in plentiful supply. Preserves are all homemade and available to purchase in the shop to enjoy at home. This is one of the best breakfasts we have ever had! This is our third visit to Thyme at Errichel for dinner, but only the first time we have stayed overnight in the guest rooms. Making a night or two (or longer) of it is highly recommended as the farm offers such a relaxing environment to chill out. Standards are passionately high, service is first class and guests leave as friends. It looks like an extension is going to be required to house all the awards and accolades that the team keep on winning. 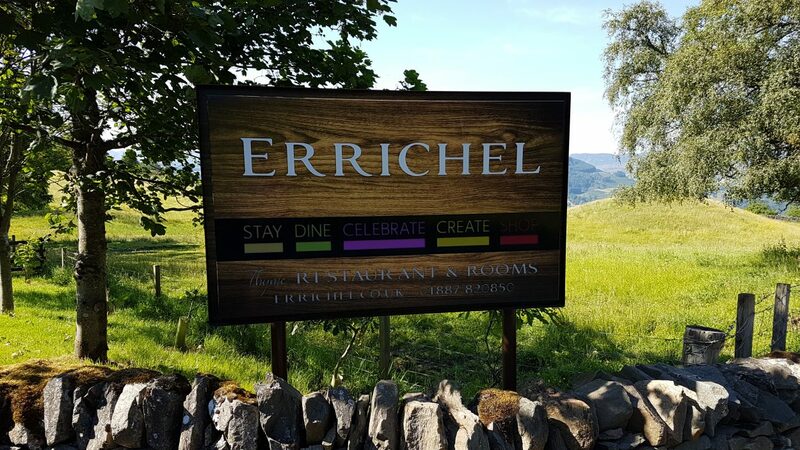 If you are looking for a fantastic place for a break, where the animals roam, Perthshire gins are flowing and the farmer is Chef of the Year, then stay at Errichel – you won’t be disappointed. How to book a stay at Errichel. Contact Fiona or Rebecca at Errichel and they will help arrange your stay. Thanks to Paul, Rebecca, Fiona and team for inviting us to stay and experience life at Errichel.